Since no team got relegated from J1 last season, the general prediction about the J2 this season was that it was going to be a close season for many of the higher-level teams. But what do we know? Kyoto Purple Sanga have taken a huge lead over the other teams -- after 13 rounds, they have 10 wins, 2 draws and 1 loss. Like Sanfrecce Hiroshima of two years ago, and Kawasaki Frontale of last year, Kyoto have leapt ahead. One of the main reasons for Kyoto's great results this season is none other than their great goal-getting ability. In the J2, there are almost no teams that are able to control the majority of a game. So, regardless of who is supposed to be the stronger or weaker team in any matchup, both teams have many opportunities to score. And in Kyoto's case, they have been able to make the goals consistently happen when the chance comes around because of their non-Japanese forwards like Paulinho and Alemao. When you look at the defense, though, you don't see the same sense of strength. The basic style of Kyoto's defense has been for the back 4 and middle 4 to assert their lines properly -- they lure the opponent into their area and steal back the ball from there. They have some tall centerbacks who can defend against crosses, and the defensive midfielders (like Meta and Saito) pick up the ball from there. This has been the general policy in the team continuing from last year, and everyone involved is absolutely aware of their responsibilities. However, as a whole the team does not have a united concept of defense, and the general feeling among reviewers is that Kyoto's defense may prove too fragile if we were to put them in a J1 environment right now. If you look at the 0-3 defeat to Sagan Tosu in the 12th round, the centerbacks were unable to respond well when Sagan were able to get the ball into the area behind the sidebacks despite the fact that their defense line wasn't kept that high. But Kyoto have been able to maintain a decent amount of stability overall because they were able to add good players to their roster in the preseason -- even when their main defenders like Teshima and Okubo could not play, the defense line did not crumble. The new recruits like Washida and Ricardo have been performing well in their place. Part of the new transfers this season included a trio who have played under coach Hashiratani during his Yamagata days. These guys quickly understood the coach's strategies making things much easier for the team as a whole. Of course all these new transfers were made possible by Kyoto's advantageous financial situation. So even if we look with a little concern to their defense, on the whole we have to acknowledge that this team certainly deserves to be way ahead in the table. Shonan Bellmare: This team is currently in 6th place, but the overall comments have been that their games have promising content. The presense of newly acquired players seems to have shaken the rest of the team, motivating everyone to play better. One player to focus on would be Sato, who came from Cerezo Osaka. Though many think of him as a left sidehalf, his move to defensive midfield at Bellmare has proved a very smart move. Organizing the team from that position, he creates a good rhythm for the team and uses his accurate passing skills to mix long and short passes, giving the team different options on the offense. He likes to use the sides too, so if the team is stumbling against persistent pressure from the opponent Sato will use long balls to poke at the back side area for opportunities. Coach Ueda stresses a compact team, and the players seem to understand that. With regard to Avispa Fukuoka and Montedio Yamagata, they are doing okay but have been getting too many tied games (Fukuoka have 8 draws, Yamagata 6). They should have been doing better, securely getting the three points in a number of matches they ended up tied. It is possible that this inability (by these two teams to get the wins) is the reason behind the congestion of teams vying for second place in the J2. Sagan Tosu: I did a review of Tosu last week already, but just to touch on them in the context of the entire J2... Tosu have been able to put a better performance this year because they have made great improvements to the individual quality of players as well as the team strategy. Lots of new players with better abilities have been brought in. And there is a defensive awareness in the team that starts higher up on the pitch -- not just back at the defense line. By putting on the pressure higher up near the front line, they have been able to put together swifter offensive plays. A little painful to watch are the teams new to the J2 -- Thespa and Vortis. Though Thespa Kusatsu has gotten a new coach in Tetsuka, who had started off by declaring he wanted to create an attacking team, the players have not been able to either understand or put into play his wishes. At the 11th Round, they switched the formation back to 3-5-2. Though they haven't seen the results yet, the return of experienced playmaker Yamaguchi may prove to be the next piece of the puzzle. Thespa have players who can put on a solid/decent performance, so all that the team seems to need in order to make improvements is to have a clearer understanding of what the coach wants from them -- and put it into practice. As for Tokushima Vortis, they seemed to have everything lined up -- 7th year coach Tanaka and new players with experience at the J1 level. But these new players aren't fitting in well. One article said "the rest of the team is trying to fit themselves to the new players, not the other way round." By doing this, the team has basically ignored all that they have learned and built up to this year. Plus the injuries to Hayashi and Kataoka (who were key players during Tokushima's fight to the top of the JFL) have been a blow to the team. Reggina, Fiorentina, and Mallorca, who were each not out of relegation-danger going into their last round game, were able to scrape by and remain in their respective leagues. ... And four Euro-based players added to NT roster: Hide Nakata, Shunsuke Nakamura, Atsushi Yanagisawa, and Koji Nakata were called up to the NT roster for the upcoming WC qualifier games. Naohiro Takahara joined the NT last week but his hamstring injury is going to keep him from going to the Bahrain game -- he'll wait to join the team for the next game against North Korea. Gamba's Maeda tipped in a crucial game-winning goal in the final moments of their game against Frontale. After becoming the 10,000th goal scorer in the Nagoya game, Maeda went on to add an assist to his record in the game against Cerezo, and now has come through on a game-winning goal. It's good to see that he is taking full advantage of the opportunities he gets to be out on the pitch. Kashiwa Reysol lost to Jef Chiba 5-1. After the game, the supporters refused to leave the stands for 90 minutes calling for the sacking of Coach Hayano. The club management people went out to negotiate with the supporters, and I believe they were able to come to an agreement to meet together some time later this week. The club situation is very bad. There was that incident when Reysol supporters charged into the visiting Nagoya stands after being provoked by calls from the Nagoya supporters. It ended with a 10,000,000 yen penalty on the Reysol club, the dissolution of two of the main supporter groups (who felt it was the right thing to do to show their remorse for what happenned), and formal charges filed against one of the attackers. The supporters this weekend aimed their frustration at the club and particularly the coach. But from what video footage I saw, it looked like the supporters weren't fixing for a fight -- they just wanted to be heard and get face time with the club. Hopefully something positive will come out of this. This season already saw Vissel changing coaches, and other teams who were supposed to be on top not doing as well as hoped initially (Jubilo, Marinos, Reds), the rapid sinking of FCTokyo, etc., so there is still a lot that can happen and time to turn things around. Speaking of FCTokyo... Hey! They won their first game in...how many games? well, let's not waste time counting. It has been a very long time, and this weekend's 2-0 win against Trinita must have been like a cup of water to a team who had been circling lost in the desert for way too long. Welcome home, boys! Well, I wasn't able to write all weekend for the blog, so I am unfashionably late addressing this game. You all probably have read much about it already, so I'm not going to blabber on too much. The shift that I noticed in both these friendly games is the team seems to be more worried about their inability to score, which means a big portion of the game had many of the Japan players up front and creating chances but unstable in back. The gap between the defense line and the defensive midfielders will probably need to be looked at, and deciding how quickly the defense line slides down may be another issue to resolve. And of course each player's toughness in one-on-one matchups. The overall impression of this team is one that is in the midst of struggling out of some shell or cocoon. But it will also be important for the team to balance the reality that is in front of them looking at the WC qualifier group standings -- that we have to tie or win the game against Bahrain. And if this means we have to play more defense-careful, so be it. Without knowing what strategy Bahrain will bring, it is hard to predict how the game will go. What I do remember from watching the Bahrain home game against Iran was that the pitch was quite poor, and attempts by the Iran players to dribble backfired. Bahrain is strong in the air, and seems to have analyzed Japan's place kick varieties -- so perhaps one tactic to use against them is speed, breaking through the back of the defense line. Also the heat will be a factor. The team has already flown to UAE for their pre-camp yesterday. And I hear they've completed their first training there already. The UAE time zone is 5 hours behind Japan, fyi! France's now Ligue 1 Le Mans Daisuke Matsui arrived at Kansai Airport today. He has confirmed a 3 year contract with the club and will be getting about 100 million yen a year. He was rented out to Le Mans from J2 Kyoto Purple Sanga in September of last year and made the full transfer this year in April. He has steadily made his place at Le Mans as an integral presence on the left side. He'll be taking a rest for about a week, have his injury looked at, and will return to training at the Purple Sanga grounds. He'll be returning to Le Mans next month on the 20th. With Le Mans promoted to Ligue 1 now, Matsui will be the third Japanese player to play in the Ligue. "I'd like to play against Koji's (Nakata) Marseille team... I'd like to keep getting results in the Ligue 1 so that I may get called back to the NT in the future," he said. 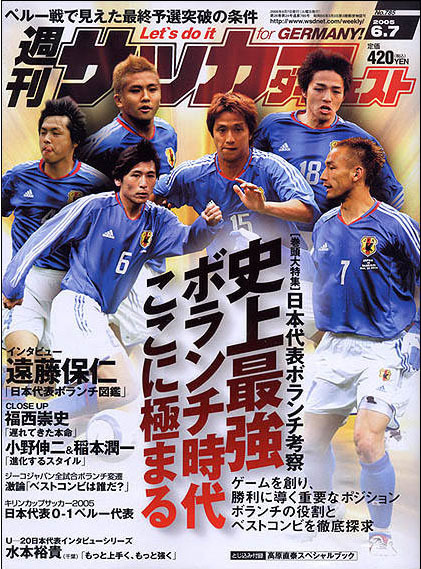 Matsui made his NT debut in 2003 at the Confederations Cup game against Columbia. At Le Mans this past season, he has scored 3 goals and has been chosen in the Best Eleven 5 times. The final word on Naohiro Takahara's hamstring injury is that it probably will affect his ability to play in the Bahrain qualifier coming up in a less than two weeks. He arrived in Japan Monday but after the doctors in Japan took a look at it they were not as optimistic as the Hamburg SV doctors were on Sunday. I did speculate in this entry about what would happen if Takahara were unable to play -- who, if anyone, would take his forward spot on the roster. From what I hear, it does sound like I was right: Atsushi Yanagisawa (Serie A, Messina) was reported to have gotten a sudden call-up notice today. Poor guy -- he always has to rush onto or off a plane at the last minute!! Whether he is going to hop onto a plane right away and join the training this week, or whether he will wait to join the NT at the UAE camp (along with Nakamura, Nakata assuming these two get called to the final qualifiers roster; oh, who am I kidding of course they will!) has not been announced. I was thinking that maybe Yoshito Okubo may have a chance at getting called, but then I remembered his team is still fighting to avoid relegation so he wouldn't be able to make it til the last minute anyway. It's too bad, since he looks to be flying high right now (two goals and two assists in his last two games). From the clips of this last game, I was particularly impressed by the quality of his crosses and his cool-headedness on one-on-one situations (against a defender or the goalie). Sorry I haven't been adding too much overall coverage this week. I will use tomorrow to go over the magazine-of-the-week and then do another J2 club profile entry on Thursday. I briefly mentioned this yesterday, but Yoshito Okubo has scored another goal this weekend during Mallorca's match against Deportivo. He also assisted in the first and second goals with some really nice crosses. Mallorca's 3-0 win in this game brought them out of the bottom-three cut-off mark, but they are still in danger of relegation depending on how things go in the last round of the Liga. It's good to see him getting some results with the team again. He had a great debut in the Liga with a goal and assist (also against Deportivo) but after that he sort of hovered on the bench for a long time plus was out to injuries as well for a while. For a video clip of the highlights, please right click and download this link. Okay, let's start with the easy stuff: In Europe yesterday. ◎Feyenoord's Shinjo Ono got the second goal of a 6-3 win over Den Haag -- he broke through to the top on the left and completed with a left foot shot to the right side of the goal. ◎Okubo scored another goal for Mallorca in their 3-0 win over Deportivo. ◎Reports from Takahara's Hamburg team doctor seem to indicate that Taka is okay to join the Japan NT. He looked to have torn/pulled his hamstring in this weekend's game. I guess he'll have to be checked by Japanese doctors when he arrives in Japan tonight or tomorrow. Japan Lose to Peru 0-1 in the last couple minutes of injury time. The fault was not in any one player, which makes it difficult to simply blame it on one mistake or one specific performance. Instead, we sort of wasted time with meaningless passing.In Japan, the catch-all word used for the lack of a high-quality finish is 決定力不足. (ketteiryokubusoku) There were a number of fine opportunities -- but the finish went directly to the goalie or wide. Despite having so much possession, we hardly used that time to advantage. There was room for much much more. But even before we get caught up in the idea of the finish, it's probably more important to look at the series of events and decisions that preceed the finish. Today, Japan had the majority of possession yet could not find their rhythm, couldn't move together. Peru did start the game with persistent pressure, and you could partly blame that. But after the pressure eased a little, the Japan players were still positioned poorly and lukewarm on offense. Most of all, the defensive midfielders were missing (or slow to arrive) for the offense up top. Japan's offense requires midfield participation, so it's a must that enough numbers are present when a cross goes in, etc. There were huge holes on the field just when it was a good opportunity for Japan to turn the heat on -- players had few options for passing and creating chances. When offensive passing did occur, they lacked precision control (control on the one-touch, control of the trap). Most of all, there were very few targeted angled passes -- those passes with pace and a clear thought/plan behind it -- to perfectly open space into which teammates should run. Peru did a nice job of holding back Japan's sides -- mostly Santos, actually, who seemed to worry them most. On the other hand, Miura who played on the right today was one of few players who showed dynamism. He did show that he may have more options in his arsenal than Kaji has shown so far. Particularly effective were his speedy low crosses and his mid/long-range non-rotating shots. Ogasawara was clearly marked by Peru, and did a decent job of things, but he also lacked that surprise factor -- he made some attempts down the middle, but they were thwarted by the defense. It also didn't help that the forwards and the dmfs were all over the place. There were a number of good free kick chances, but those kicks did not go in -- if they had, it may have changed the energy of the game. Overall, though, the impression was a tired game of Peru staying back and erasing Japan's strengths and Japan unable to move past the midfield. I mentioned the performance of Miura above. He has not had many opportunities to start, and he did use this game to show that he is at least better offensively than Kaji. Defensively, Kaji is probably more stable. In addition, the substitution-in of first fw Oguro and dmf Inamoto clearly showed these two Osaka boys could add energy and attitude to the offense. Motoyama was subbed in as a forwad in the final moments of the game for Suzuki but he was not a particularly threatening presence there. I guess Zico was hoping he would use some of his quick footwork and dribbling to break down the defense. Tsuboi made his first start in this game since his injury last summer. He played on the left side of the defense line. (It seemed today the defenders were playing a zone-ish defense, as Nakazawa was missing) He was okay, used his speed to his advantage for most of the game, but still seemed to lack confidence when it came to feeding the ball forward -- he handed that task off to Miyamoto a lot. It also sounds like his muscles were tightening up by the end of the game and he couldn't run normally by the time Peru was on their counter-attack in that last couple minutes. He was supposed to cover the player with the ball coming in, but he fell behind slightly, just allowing Peru to tip the ball passed goalie Kawaguchi who dived for it. (There was a little hesitation between the two in this scene.) It was not entirely the defense's fault though -- it was the final moments of the game, and Japan obviously had to go for a goal with the score tied 0-0 -- they had a lot of players up front, but their attempts in were blocked and the ball bounced to Peru for the counter. It was a calculated risk we were taking, and it rolled in Peru's favor. What frightens me most is the inability for many of the players to "feel" the play in advance -- sense where they need to be before the ball gets sent forward. See the play two passes into the future. Anticipate, run, slip in. Free running. Off-the-ball. Whatever we call it. In this, I have to say Inamoto and Oguro played better than the rest. Ina told Endo he was going to go up, and he made sure to keep moving ahead of the play so that he was in a good place when the ball needed somewhere to go. First, if the team can deal with their positioning problems and lack of energy, that would certainly provide some better opportunities in future games. From the player comments, it does sound like everyone is pretty disgusted with themselves as a team. Peru was a darned good team to play against at this point in the year ahead of the qualifiers. Certainly better than the two teams we played before the first qualifier against North Korea this year, where Japan won 4-0 and 3-0 and then went on to be caught off-guard by the toughness and fighting attitude of the NK team. Nothing so dangerous as complacence. And nothing as motivating as a loss like this. It was also good that Tsuboi and Oguro got to play for a certain length of time too. As for the next game against the UAE, I don't want to speculate, but we may see a different line-up starting. Well, the Kirin Challenge game between Japan and Peru is...oh, already twelve hours away. Kind of strange how these games sometimes creep up on me. I've been keeping my ears open for any interesting news from the NT training camp in Niigata, and the only news of late has been the injury to Yuji Nakazawa (left def) during a practice game against the Albirex Youth team. It looked from the video like the pain was in his lower back/right side area. Jubilo defender Chano was called up to take up the empty slot ahead of these two friendlies, but I believe Reds' def Tsuboi will be starting today in Nakazawa's position. After the tumult of the last two qualifier games and all the drama that those two weeks contained, it's difficult for me to have any idea what today's game will be like after the two months lull. The players look/sound tired -- they had all those games to play in the J-league these past few weeks, and they have four international games ahead of them within the next two weeks. I can only assume they won't be at their fittest in today's game. I saw a bit of the game between Hamburg and Bochum today, but unfortunately JUST as I tuned in they went into halftime. And then the minute the second half started, Takahara got hurt. I don't know whether to laugh or be mad, but really this is terrible timing for him. The injury looked like a muscle thing (he was holding the back of his left thigh, and stopped running and fell to the ground). If it turns out to be a serious injury, I wonder who will be called up to the NT to replace him (he was supposed to join the NT within the next few days) -- from past Zico choices, I am going to assume it's going to be Yanagisawa. Perhaps Yana will join the team in the UAE camp after his club Messina finishes their last game -- it could cut down on the jet lag/fatigue factor. If Zico wanted someone right now though, it's hard to figure who he'd choose from the J-league. Most of the J's top forwards are not Japanese. And the only other person I could think of is Okubo who is currently in Spain (he just got his second goal at Mallorca last week). But he'd have the same travel/time zone issues as Yana. I had mentioned in a past entry that Yana's inclusion in the Juventus tour of Japan in June basically assumed he was not going to be included in the NT games this month (the friendlies, the qualifiers, and the Confed cup). Yana strayed away from the NT last year when he was chosen to be part of the squad that was heading to China (Asia Cup). He had just signed on with Messina, and I guess he thought it was better for him to make a name for himself at the club rather than play for the NT at the Asia Cup (which doesn't have the same dazzle factor in Japan's football community). Anyway, he specifically asked Zico if he could leave the NT and go back to Italy. Of course, what awaited Yana there was less than splashy, while the NT went on to play legend-creating games in hostile China. Yana was then called to the India qualifier in September but was suddenly told he didn't need to come (he and Nakamura) because I guess Zico felt the team could pull a win without these two having to fly all the way over. Right before the Iran game this year, Yana was called up suddenly after Fujita was injured. Yana was able to play, and was involved in Japan's only goal of the game. But if it turns out that Yanagisawa is called to the NTwithin the next week or two, it will be interesting to see to what degree he will trump Oguro in the pecking order. The current buzz right now is on how Zico will or won't use Oguro (fw, Gamba, and current top goal-getter in the J-league). Zico stated in a press conference yesterday that he will be starting Suzuki (fw, Antlers) and Tamada (fw, Reysol) in today's game. When asked about why he is not starting Oguro (who has scored ten goals to Suzuki's 2 and Tamada's 0 in the J-league this season), Zico answered that with regard to intra-NT choices he puts more emphasis on the overall contribution/experience of the player in the NT, not just at the club level. In other words, Oguro will have to take the opportunities he does get and climb his way up in the sacred order. Japanese football fans are convinced he will be able to blow his competition away if he'd only get the chance, and his performance during the practice games with the NT recently has shown that he meshes very well with omf Ogasawara. He's shown in practice that his off-the-ball movements (his movements while the ball is not in his possession) has brought variety to the offense. But again, this is in practice games against youth players who know who Oguro is. He attracts opponent defenders and thus allows his teammates to freely use the exposed sides. However, at the international level, he may not affect the opponents in the same way. And, Oguro on the bench may turn out to be better to have as an ace-up-the-sleeve if things get tight for Japan (like at the North Korea game). It's reassuring to know he is there, though -- considering Tamada and Suzuki don't consistently get goals and Takahara is out to injury. As for other news, it sounds like Kaji (right side) is still nursing an ankle injury, and Atsu Miura will be starting on the right today. Atsu Miura started in the Iran game as a left sidehalf when Santos was injured, but he actually is able to play either if necessary. At Vissel, the new coach Leao has even started him playing as an omf (not that the NT needs another omf, but...). But still this is a plus for Miura as it has allowed him to experience the game from a different position already in the last few weeks. Oh, and I forgot to mention this sooner but the Nabisco Cup games were played yesterday. I had been cheering for FCTokyo, but alas they were again defeated by Jef Chiba's ability to make the goal when the chance came, though the second half was mostly FCTokyo on the attack. What is it about Jef that is keeping them in the J-league shadows all this time? It's almost shocking that they have not gotten the kind of air-time that some of the other teams/players have been getting in the J-league. I mean, Captain Abe is always a mass media favorite, if sports news producers want to play up that angle. And forward Haas (who was out to injury for this game) is more than a "big foreign forward" -- I think he could more than rival Verdy's Washington in terms of overall technical ability, soft touches, and has an amazing passing sense. On TOP of that, yesterday's Nabisco game against FCTokyo saw the debut of .... Gabriel Popescu. Yup, THAT Popescu; he came to the J this season from K-league's BlueWings. He hit things off well with his first J goal...the only goal of the game. Catch Up on Le Mans Videos: Here's a clip from the LeMans vs Guingamp game (0-0) and here's one of the supporters celebrating the move to Ligue 1. I'm always worried that when I discuss in depth a team that is finding its groove in this blog, I am somehow going to jinx them. Which was why I was a little worried about seeing the J2 results today; I actually put it off for a while. Of course, I HAD to look eventually, and what a relief to find that after all I went on about them yesterday, Sagan Tosu were able to get a clean win against Sendai 1-0. And the first time at their home stadium too. The goal was a beautiful long range shot (30 meters) from Takabayashi. The story of new heroes continues for Sagan, as this was Takabayashi's first league goal. In 13 rounds he's made it to the bench 3 times, and this was his first time starting, so he is another one of Sagan's fresh new "lucky boys". Anyway, whew! I'm not bad luck afterall! Sagan are now in 2nd Place, another first for this team's history books.